The instrumental ensemble Dagamba have long been known for their compelling and unusual arrangements, particularly how they combine classical music with popular music. On their albums Recycled (2015) and Seasons (2016), they created musical fusions of many different artists, styles and eras to great effect. Dagamba have continued this path on their latest release – 2017’s #LudwigVanRammstein, which, as the title makes clear, combines the music of composer Ludwig van Beethoven with German industrial rock group Rammstein. At first glance, it would seem incongruous to combine the music of these two artists, the only similarity seeming to be that both the composer and group are from Germany. However, considering the often intense and stormy nature of the music of both, the links between Beethoven and Rammstein are closer than might initially seem. Some of Rammstein’s songs could even be considered symphonic in nature, with their broad musical and sonic palette. 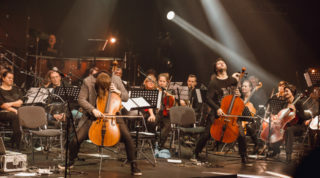 Dagamba, who call themselves ‘classical music hooligans’, are made up of cellist Valters Pūce, pianist Dainis Tenis, cellist Antons Trocjuks, Hamidreza Rahbaralam on traditional Persian instruments and occasional vocals, and drummer Arturs Jermaks. The album is not limited to just the works of Rammstein and Beethoven – for example, the opening number ‘Lullaby’, which mixes the Rammstein song ‘Mein Herz Brennt’ with a brief melodic reference to one of composer Raimonds Pauls’ most beloved melodies – ‘Circenīša Ziemassvētki’. The title of the song is perhaps slightly misleading, as it is not the tender bedtime song one might be expecting – after a tense yet quiet introduction, the full band comes crashing in to create a thunderous performance, and Pauls’ gentle melody becomes almost sinister in this context. Perhaps one of Beethoven’s most somber and sad musical works is the 2nd movement of his 7th symphony, and this melody has been used to great effect when combined with the Rammstein song ‘Mutter’ in Dagamba’s ‘Crowd of Very Old Children’. The theme, played with appropriate melancholy on the cello is now combined with drums, and, as a result, is given an almost military-like feel, which is then transferred to the weighty chords of the piano. The presence of the Iranian Rahbaralam in Dagamba has given their music even more musical and artistic flavors, adding Persian and Middle Eastern elements to the rock and classical themes. Rahbaralam also provides some occasional vocal work, for example on ‘1988. Ramstein’, a song that combines elements from the Rammstein song ‘Sonne’ and the music from one of Beethoven’s most famous piano works ‘Für Elise’ (Bagatelle No. 25). Rahbaralam’s vocal performance adds emotional heft to this tragic song, which, as its title might indicate, references the Ramstein air show disaster in 1988. Still, one does wish that there was more of Rahbaralam on this record, as it is often his contribution that makes a Dagamba song memorable. Dagamba find inspiration in Latvian folk music as well, such as in the song ‘Polytical Fairytale’, which combines the Rammstein song ‘Amerika’ with the ‘Div’ dūjiņas gaisā skrēja’, a folk song about going off to war. The sorrowful folk song, as performed by cello and piano, provides the introduction for the weighty music to follow. 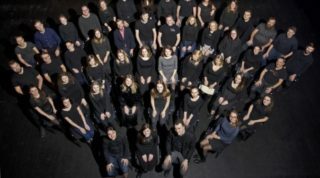 As their next project, Dagamba have selected to synthesize the works of Tchaikovsky with modern elements, and are planning a number of concerts in 2019, with a large scale concert at Arena Riga in April. One does not need to be familiar with the songs of Rammstein (or even Beethoven’s compositions) to appreciate Dagamba’s musical mélange, as their ability to weave together melodies from different centuries makes for engrossing listening, even for those who might not be classical music or industrial music fans. It is also worth noting the significant contribution of producer (and percussionist) Rihards Zaļupe, who maintains a crisp clarity in all the songs. Helpfully, Dagamba have identified the Beethoven works and Rammstein songs used in each of the tracks on the album, so those who are familiar with the originals will appreciate these new arrangements even more. #LudwigVanRammstein is indeed a turbulent experience, and Dagamba’s vibrant performances are befitting of the intensity of both the works of Ludwig van Beethoven and Rammstein. For more information, please visit the Dagamba website.